Principal Linda Hill and "Berta Bucks"
Staten Island Advance/Jan Somma-HammelWith Dreyfus Intermediate School principal Linda Hill are three students who missed a month or more of school last year. But they have changed their ways in response to a new anti-truancy program. The students, from the left, are seventh-graders Justin Juarez and Stephanie Colon, and eighth-grader Mustafa Wright. 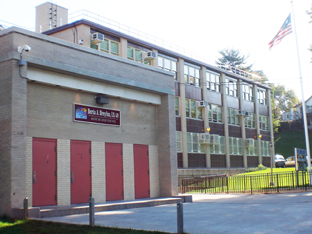 Dreyfus is one of the Staten Island schools targeted by the city's initiative. STATEN ISLAND, N.Y. -- On any given school day, more than four out of 10 students don't show up for class at PS 14 in Stapleton. At nearby Dreyfus Intermediate School, more than one-third of the students are no-shows each day. The city is making plans to put these chronic truants in their place -- specifically, in the classroom. And it's getting personal. The mayor's office is wooing students who skip a month or more of school by taking a personal approach -- delving into their family lives and offering rewards for coming to class. The so-called "truancy initiative" is focusing on PS 14 and Dreyfus Intermediate School, among 25 schools across the city with a high number of chronic absentees. Examples include nagging parents to find out what's keeping children from getting to class, and rewarding those who come to school with a shopping spree at Old Navy. "If you're not in school, you're never going to learn," said John Feinblatt, the criminal justice coordinator for Mayor Michael Bloomberg. "Truency rates and high chronic absenteeism rates are associated with very bad outcomes down the pike, whether it be juvenile delinquency, teen pregnancy, joblessness and so on." As part of the plan, success mentors -- City Corps volunteers or students studying social work -- will be placed in each school to track 15 chronically absent students and make contact with each family. There also will be numerous incentives, such as trips and freebies, for coming to school. City agencies like the Department of Homeless Services, the Administration for Children's Services and the Health Department also are part of the initiative. Staten Island Advance/Jan Somma-HammelStudents who improve attendance and do well in other areas earn 'Berta Bucks' that can be redeemed for prizes. The attention from the mayor's office followed an alarming report released by The New School in 2008, pointing to a citywide problem in which one in five students skips a large amount of class time. According to the report, 41.3 percent of students were chronic absentees at PS 14, while 35.4 percent fit into that category at Dreyfus. Kim Nauer, one of the report's authors, called the mayor's initiative a good start, considering the financial constraints the city is facing. "Knowing they have no money, yes, I'm extremely pleased," she said. "People are awake about it now." Still, she said chronic absenteeism runs deep in the challenges of a surrounding community, and would take a lot of resources and time to delve into. PS 14 and Dreyfus Intermediate, located just a block from one another, flank the Stapleton Houses, the largest public housing complex in the borough and a main feeder to both schools. PS 14 is on the state's list of persistently dangerous schools; Dreyfus was only removed recently. Both are listed under the state's list of Schools In Need of Improvement. Both schools have a large population of minority children, with 81 percent of students at PS 14 eligible for free lunch and 71 percent eligible at Dreyfus. Among the challenges the principals see are single parents, families with lower socioeconomic backgrounds and children with health problems. Since September, PS 14 has been concentrating on 122 chronic absentees, while Dreyfus has been focusing on about 150. The school chancellor's regulations say each child is expected to have a 90 percent attendance rate, which both schools are aiming to maintain. "There are a lot of variables involved with the families. A lot of things happen to them in their lives, and young children take on a lot of responsibilities," said PS 14 Principal Nancy Hargett. "We do whatever we can to find out what we can, whether it's because the children don't have the proper clothing to come out that day, or maybe they had to bring their siblings to school first." She said some students come from two nearby shelters, and she has no clue how long they'll actually remain in her building. Last week alone, seven new children walked into her school. The staff looks for patterns -- for instance, zeroing in on the large group of students who show up 30 minutes past the morning bell -- Ms. Hargett said. Latenesses are also calculated into the attendance rate. "It's a very hard, challenging job ... it's not all roses for me," the principal said. "It's a very tough community, a very hard community. But I think, in the long run, for those children that are here -- and they're sweet little darlings -- any little bit will help." PS 14 also has partnered with Dreyfus to hold parent summits, inviting families to talk about the importance of attendance and letting them know about city services that can help those who are struggling. "I know our parents are overwhelmed with responsibilities, with many of them working two jobs," said Dreyfus principal Linda Hill. "It's a challenge. I understand it from both sides of the picture. If you have your job in jeopardy, and you have to be there, yet you have a sick younger kid, what do you do?" She said the school also has a student-only summit called Dreyfus Everyday for Success, in which students meet regularly and participate in activities. A recent raffle granted some of the students a trip to see "In the Heights" on Broadway. "It validates them. They are a member of an organization that cares," Ms. Hill said. "They absolutely feel good -- you can just see from the smiles. That's not a whole lot of data but it's something that absolutely can be recognized." The summit complements existing efforts to promote attendance and good behavior. Among those efforts are the M&M Club, which stands for Mentors and Mentees and pairs adults with students, and Berta Bucks, in which students are rewarded with fake money to redeem for small prizes. On a recent afternoon, several students in the truancy program spoke proudly of the improvements they've made in their attendance so far this year. Mustafa Wright, an eighth-grader, missed 65 days of school last year after his family moved to Staten Island from the Bronx. Now, Ms. Hill said he's only missed three days so far, and is holding steady with a 96 percent attendance rate. "I'm going to graduate this year, so I want to pass all my classes," the 14-year-old said. Stephanie Colon, a seventh-grader who also moved to Staten Island a year ago -- and attended the same Bronx school as Mustafa -- said she missed 26 days of class last year because it was tough to focus. Since she's been coming every day so far this school year, she's found it's easier to keep up with schoolwork. She said the school staff has been attentive, which has helped to keep her on track and resist temptations to cut class. "They told me that no matter what, they want me to talk to them and that they would welcome me with open arms," the 13-year-old said. "Sometimes my friends say they're going to skip school and ask if I want to come. I just say no and then I walk away." Getting to class has been especially tough for Justin Juarez, also in the seventh grade. The 13-year-old's grandmother, who played a strong role in raising him, recently died, and he has been suffering from depression. Justin said he missed 22 days of school last year, but that he's managed to keep a 100 percent attendance rate so far this school year. Going to the Old Navy event -- during which he met his favorite baseball player, the Mets' Jose Reyes -- was a definite incentive. "Some days I get up and I'm tired and I don't want to come to school, but I tell myself, 'you have to go,'" he said. "At the end of the day, I feel good." Linda Hill, the principal of Dreyfus Intermediate School in Stapleton, is being blasted as "insensitive" after an alleged comment at a faculty meeting. A Staten Island middle school principal is being blasted as "insensitive" after reportedly forgetting the name of an eighth-grader at her school who was severely injured in a textbook-tossing incident, then referring to the teen as "spleen boy." Linda Hill, the principal of Dreyfus Intermediate School in Stapleton, made the "spleen boy" remark on Monday during a faculty meeting, according to sources present. The teen's name is actually Chaz Carvalho, 13, of South Beach. Carvalho's spleen burst after his classmates pelted him with flying hardcover textbooks on Oct. 3 during a bizarre variation of the "Quiet Game." Doctors removed his spleen two days later, and used 29 surgical staples to re-seal the incision in his stomach. A city Department of Education spokeswoman yesterday confirmed that Ms. Hill made the remark. "The comment was inappropriate but made at a closed staff meeting and not intended to be malicious," said spokeswoman Dina Paul Parks. "The principal is apologetic. We do not anticipate taking disciplinary action." "It's beyond insensitive at the very least," said Carvalho's lawyer, Ralph Porzio, a former Family Court judge. Even though he didn't believe Ms. Hill was deliberately mocking Carvalho, Porzio questioned what was going on in her mind when she forgot the teen's name. Advance file photoChaz Carvalho, 13, reveals his scars in his South Beach home. "That's the first thing out of her mouth?... That's the insensitivity. This child is someone who has been scarred literally and figuratively," Porzio said. He added, "This isn't 'Seinfeld.' This is life. You're allowed to be a little bit nasty in 'Seinfeld,' but not if you're the principal of a school." Ms. Hill refused to discuss the matter when contacted by the Advance today. "I really don't have any comment, thank you," she said. The textbook toss happened while Carvalho's eighth-grade math class was being supervised by a first-time substitute teacher, who school officials say never reported the incident to administrators. Carvalho went to the nurse after class, but only admitted to having a stomach ache. He didn't mention the flying textbooks until two days later, when the pain wouldn't go away. Ms. Hill wasn't present in the school building the day of the incident -- she was on a camping trip with students and faculty, according to school officials. Ms. Hill brought the matter up during the faculty meeting as an example of why teachers needed to report classroom incidents as soon as they take place, but she forgot Carvalho's name, and called him "spleen boy" instead, according to sources. The comment elicited shock from some of the teachers present, said one source, who spoke on condition of anonymity. "She realized her mistake, and kind of repeated it again with a nervous laugh," the source said. "When I heard her say it the first time, I was taken back by the whole thing," the source said, who spoke on condition of anonymity. "If it was a teacher that said it, and a parent complained, she would have their back to the wall."